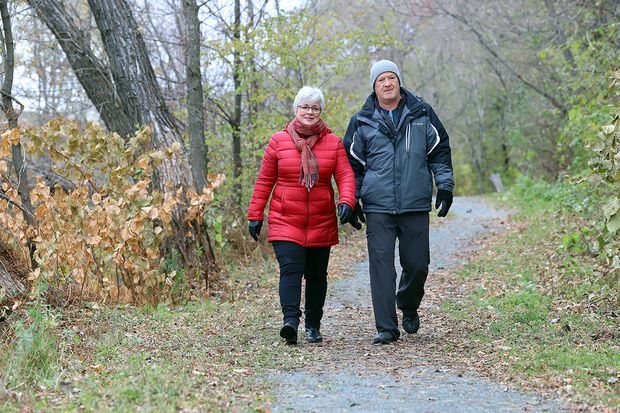 To help manage osteoarthritis pain, Tom Kellar and Colleen Fraser stay active, including taking regular walks near their Sudbury home. Tom Kellar and his wife, Colleen Fraser, from Sudbury, Ont., have always tried to stay active by going to the gym, walking, or hitting the trails on snowshoes or skis during the winter. But in recent years, pain made exercise a challenge for both of them. For Kellar, the pain was particularly bad in his left knee, while Fraser had both hand and knee pain. “When you’re in pain, you’re tired all the time. It has a negative effect on your day,” says Kellar, 60, who works as a sales rep. His sister had a knee replaced, so he assumed he would as well someday. Fraser, 61, was diagnosed with osteoarthritis (OA) first, through X-rays ordered by their family doctor. Kellar went through the same process himself a year ago. As a result, his chiropractor, Dr. Anjelica Mazzella at Back 2 Health Rehabilitation Centre in Sudbury, referred him to Good Life with osteoArthritis in Denmark (GLA:D) Canada, a program she teaches locally that was first developed in Denmark. After reading the course information, Fraser also decided to join the program. With sites across Canada, GLA:D offers eight weeks of health education and exercise instruction to help people with knee and hip pain, mostly from OA. The program is supervised by trained practitioners in the GLA:D program, which include chiropractors, physiotherapists and kinesiologists. The couple found themselves stretching regularly and working muscles they didn’t know they had. Within weeks, the pain associated with their OA almost entirely went away. Now they’re exercising independently — Kellar uses the elliptical and weights and performs stretches; Fraser sometimes joins him but also does Pilates and yoga classes. While they exercised before, the GLA:D program had them adding in more cardiovascular exercise, plus doing it more often. Aging, obesity and chronic health conditions amongst other things, can lead to limited mobility and strength that can contribute to problems in the musculoskeletal (MSK) system, which includes the bones, muscles, tendons, joints and ligaments. Women are more at risk. According to an MSK report prepared for the 2015 World Health Organization (WHO) Report on Ageing and Health 2015, OA, osteoporosis and sarcopenia (muscle loss) affect millions, and can lead to very serious outcomes, such as falls that shorten lifespans. “We’re living longer but not necessarily healthier,” says Dr. John Antoniou, an orthopaedic surgeon and president of the Canadian Orthopaedic Association. More collaboration between health care providers can help Canadians with these conditions get healthier. For example, an integrated approach between a physician who is supporting patients with chronic health conditions and a chiropractor assisting in managing the MSK components can help those patients become more active. This, in turn, can then positively impact their chronic health conditions. Exercise also impacts health. One 2018 review study found that, among more than 2,300 people with chronic knee and hip pain from OA, exercise helped with pain and function. “It’s the golden rule of nature. You don’t use it, you lose it,” says Dr. Kenneth Stelsoe, a chiropractor and owner of Enhanced Wellness Studio in Waterloo, Ont., and a provider of the GLA:D program. For most people, musculoskeletal problems start with mild symptoms, such as the joint pain, stiffness and swelling seen in early OA. Discomfort can cause you to limit activity, leading to weaker muscles. You lose more range of motion and things start to increasingly hurt. “You begin using muscles and joints wrong, which makes it worse,” says Dr. Stelsoe. At this point, people may stop exercising and begin limiting their everyday activities too. “A sedentary lifestyle tends to lead to a lot of chronic diseases, including cardiovascular disease and diabetes,” says Ed Ziesmann, vice-president of education programs and services for the Arthritis Society. It triggers balance problems, which put you at risk of falls. Meanwhile, when people have multiple conditions, they must juggle a wide range of medications and all their potential side effects. Being physically active can turn things around for those with MSK conditions, but only one in five Canadian seniors get the recommended 150 minutes of activity per week. Exercise as therapy can be a challenge for those who instinctively stop moving once they have mild pain. “The mentality is sometimes it hurts, so I won’t do it,” Ziesmann says. They need to push through discomfort, but stop when they feel true pain. Guidance from health care professionals on “hurt versus harm” can make sure exercise is healing, not hurting. Meanwhile, for the many people who don’t enjoy traditional exercise, such as going to the gym, Ziesmann advises focusing on doing everyday life activities such as walking, gardening and playing golf. The most common type of arthritis, it affects 4.6 million people. According to the Arthritis Society, it’s a progressive disease of the whole joint, which over time leads to the breakdown of joint cartilage and underlying bone. Severe OA may lead to hip- and knee-replacement surgeries. Our bones decline in density as we age, starting at age 30, and if bone mass gets dangerously low, it’s called osteoporosis. “The higher you get your bone mass up before 30, the lower the risk of getting osteoporosis later,” says chiropractor Kenneth Stelsoe. The condition affects two million Canadians, and many only get diagnosed after breaking a bone. Muscles naturally get weaker as we get older, but underlying conditions or inactivity can lead to this condition, which involves serious muscle loss and weakness. In Canada, it affects about 12 per cent of women and seven per cent of men between the ages of 60 and 69. One 2012 study, published by the U.S. National Centre for Biotechnology Information (NCBI), found patients with sarcopenia were more than three times more likely to be at risk of falls.